The nation’s increasing racial, ethnic and cultural diversity shapes the College of Education of Harris-Stowe State University. Additionally, the college seeks to be inclusive of individuals with exceptionalities. Consequently, the college is expected to enrich and enhance the academic and socialization experiences of its students and faculty by diversifying the population of its environment. The College of Education of Harris-Stowe recruits, values and nurtures diverse perspectives and abilities and extends an hospitable environment to all. Encouraging such diverse perspectives serves to expand the disciplines, ideaologies, paradigms and methodologies and promotes and enhances a renaissance of knowledge. There are certain courses required to help the student meet the challenges of living in a multicultural, highly technological and information-based society. These courses assist the student in educational, personal and social adjustment during and after the collegiate experience at Harris-Stowe State University. In accordance with the articulation agreement established by the coordinating Board of Higher Education (CBHE) in Missouri, courses within the General Education Program are also designed to meet the standards of the College Transfer Guidelines. Therefore, the role of the General Education program is to provide introductory courses in a variety of disciplines outside a student’s major area that direct the student’s attention to a central core of problems and disciplines with which all human beings, regardless of their more specialized interests, must be familiar and competent. The current structure and content should not be viewed as a permanent program for the future but rather as a framework for the present, which will be subject to continuing reevaluation and change as the needs of society change. The General Education Curriculum has been designed to accomplish the overall goals of the institution and classifies knowledge into five areas, each of which makes a special contribution to the development of the individual. The Teacher Education program at Harris-Stowe State University provides a learning environment emphasizing informed inquiry, multicultural opportunity, educational technology, attention to individual differences, collaboration with others and commitment to lifelong learning. High priority is placed on the educational growth of students and on enhancement of their potential leadership qualities. The teaching-learning process emphasizes the interaction of the following elements: leadership, development techniques, effective use of technology and learner responsibilities. The Bachelor of Science Degree in Education and a certificate to teach in Missouri is awarded to the student who has completed the requirements of one of the curricula in education and met all applicable general education, major and specialization requirements of Harris-Stowe State University. All students who have been admitted to a Teacher Education program, both degree-seeking and those seeking certification only, are presumed to be preparing themselves to teach and therefore must meet state certification standards. Any exception to this policy can be made only on the basis of approval of a student’s formal petition to the vice president for Academic Affairs. 1. It is a University requirement that students graduate with an overall cumulative GPA (OCGPA) of at least 2.5. The Missouri Department of Elementary and Secondary Education (DESE) has established a minimum certification of OCGPA of 2.5 (on a 4.0 scale) that is computed by using the transcript grades in all college-level credits attempted at all institutions attended. 2. The four programs have varying requirements for study in the major area, general education and elective study, which may require additional semester hours as specified in the curriculum. 3. 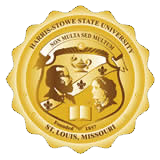 A candidate for a bachelor’s degree must complete his or her last 30 semester hours at Harris-Stowe State University. 4. Students are required to attain a grade of "C" or better in all professional-level courses. Middle School and Secondary Education students are required to attain a grade of "C+" or better in all professional-level courses and must earn a GPA of 2.5 in subject matter area courses. 5. Students are required to attain a OCGPA of 2.5 or above and a passing score on the MEGA to earn the B.S. Degree in Education and a Missouri Teacher Certification. 6. Submit a Degree Conferral Packet to the Office of the vice president for Academic Affairs in the semester prior to anticipated graduation date. (Specific dates are available in the Schedule of Courses Offering document.) Students must purchase the Graduation Packet from the Cashier’s Office. 1. Candidates for initial certification must complete all requirements identified on the Official Individual Evaluation Sheet at Harris-Stowe State University and be approved by the directors of Admissions and Academic Advisement. 2. Students are required to attain a Grade of "C" or better in all professional-level courses. Middle School and Secondary Education students are required to attain a grade of "C+" or better in all professional-level courses and must earn a GPA of at least 2.5 in subject matter area courses. 3. Students are required to attain a CGPA of 2.5 or above and a passing score on the MEGA Examination. 4. Secure an Application Packet for Missouri Certification from the Office of Records, HGA (Fee Assessment not applicable.) Deadline dates for submission of completed packets are listed in the Schedule of Course Offerings document.